The deep environment of Hagit’s approach and method enables Hagit to push participants to their full potential and to enjoy moving. 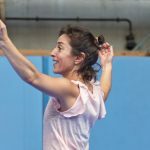 Combining her skills and expertise as a dance movement therapist with her philosophical approaches to dance, performance and education, she encourages passionate, emotional and experimental approach to dancing and improvisation. Hagit: “My work is based on emotions. Using emotions as a source of knowledge and communication rather than in a sense of expressing one self. I start my research with different physical tasks, which I repeat and exhaust until I discover the emotional potential these exercises can convey and provoke. These explorations are based mostly on group works, they therefore deal with co-dependency and interdependency, and it enables me to explore a self in relation to others. This kind of work involves emotional investment during the creative process and the performances. It requires a very deep and trustful process and it posits the performers and the choreographer (myself) in a very vulnerable and exposed place. The more I delve into my work the more I discover that this kind of work relies completely on the idea of responding. And it is this notion – the responsive part of my work that I would like to offer as an exploration in the form of a creative and choreographic workshop. I would like to offer it for performers and makers as well as for all of those who are interested in connecting to others through movement. In the workshop I aim to charge the movement with emotional intensity and then find different ways of witnessing one another in order to respond to one another. I will offer different ways of challenging the elements we are reacting to and the way we do it. Trying to figure out if this response can first provide a profound experience of empathy and acceptance along side a challenge and unfamiliarity. And second if it contains information for further exploration of relationships, aesthetic and a sense of identity.